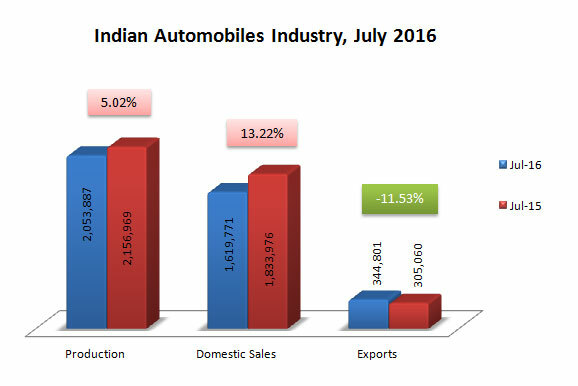 With most of the sub-segments showing positive sales growth, Indian automobile industry clocked better performance in domestic sales growth for July 2016. The biggest boost came from growth in the high volume segments like Cars and Two-wheelers namely scooters and motorcycles. 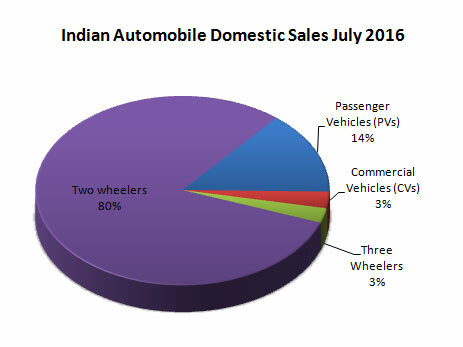 The Indian automobile industry witnessed a double digit domestic sales growth of 13.22% for the month of July 2016 over the same period last year according to the Society of Indian Automobile Manufacturers (SIAM) released data. The production of automobiles showed a modest growth rate of 5.02% for the month of July backed by good production numbers in utility vehicles, goods carriers and three wheelers. 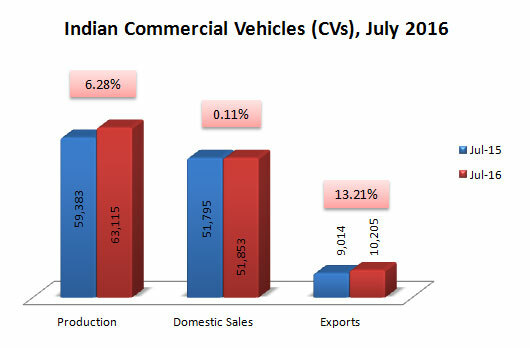 Automobile exports continued to register negative growth with a decline of 11.53% for the same period. 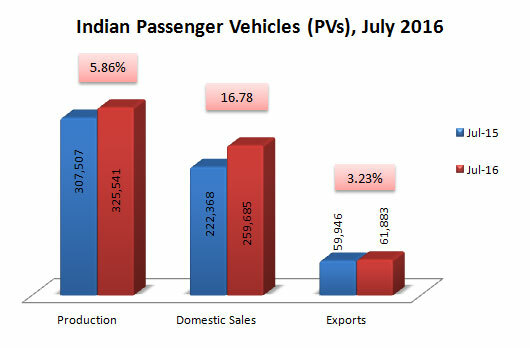 The Passenger Vehicles segment of Indian domestic automobiles market recorded a handsome growth of 16.78% for the month of July 2016 over the same period last year, which managed to make passenger vehicles as the highest growth segment for July 2016. Passenger Cars sales recorded a decent growth of 9.62% in domestic sales, while the Utility Vehicles segment registered the highest sub-segment growth of 41.85% among Indian automobiles. Vans also registered a healthy growth of 18.61%. The Commercial Vehicles segment remained almost stagnant with a marginal growth of 0.11% in July 2016 as against the same period last year. This was due to all its sub-segments having a negative growth except for Good Carriers in LCVs. The domestic sales in Medium & Heavy Commercial Vehicles (M&HCVs) sub-segment declined by 7.61% with Passenger Carriers and Goods Carriers declining by 10.77% and 6.85% respectively. The Light Commercial Vehicles (LCVs) segment shoed better results with positive sales growth of 6.31%. The Passenger Carriers in LCVs had a negative sales growth of 4.13% while sales of Goods Carriers in LCVs grew by 8.34% saving commercial vehicles segment from sales decline. 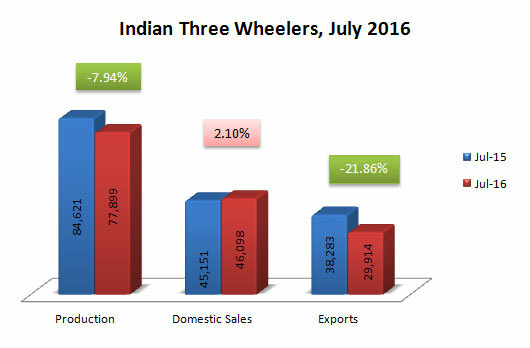 The Three wheelers segment managed just 2.10% growth in domestic sales for the month of July 2016, as a result of high growth rate of 20.35% in the low volume Goods Carrier segment. Domestic sales in the Passenger Carrier sub-segment declined by 1.21%. The Two Wheelers segment registered the second highest growth for the current month at 13.52% in domestic sales, with all its sub-segments in positive growth. Scooters grew their domestic sales by a 16.66% while Mopeds witnessed a handsome sales growth in the domestic market at 25.27% for the month of July 2016 over the same period last year. 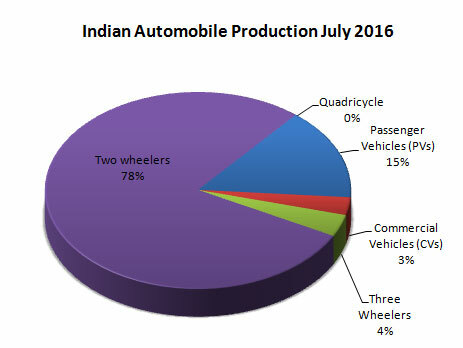 Motorcycles, which managed a decent growth of 10.98%, were way behind the other two sub-segments of two wheelers for July 2016. Automobile exports continued to register declining growth compared to production and sales. Exports were down by 11.53% for the month of July 2016 as against the same period last year. 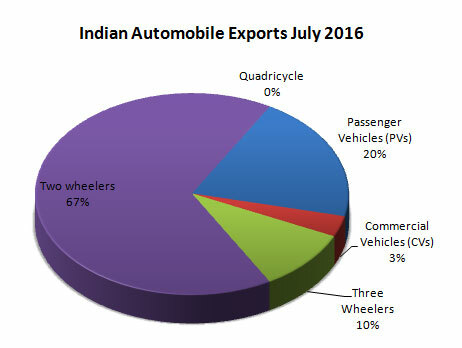 This was mainly due to declines in exports of two and three wheelers segments. The passenger vehicles registered a modest growth of 3.23% in exports for the current month with utility vehicles registering the highest growth of 79.42% for the current month. The commercial vehicles segment also witnessed a better growth of 13.21% for the month. 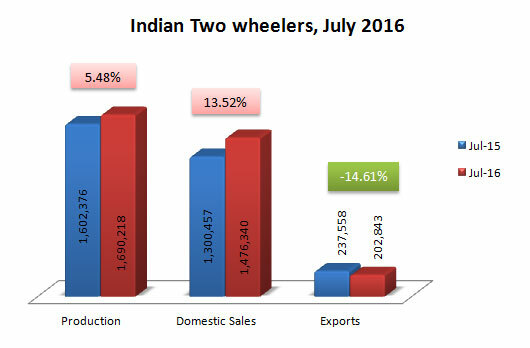 The two wheelers and three wheelers segments, bringing down the overall growth into negative, registered declines of 14.61% and 21.86%, respectively, in exports for July 2016. A unique Events Marketing and Listing platform covering MICE Industry through list of Events, Blogs and Associations as MICE Market buyers. © 2015-16. Market-Width.com All rights reserved.